A parklet is typically an extended platform over a parking space, and can include benches, tables, chairs, landscaping, and bike parking. They are designed and built by local designers, and offer interesting public spaces for people to sit and relax. 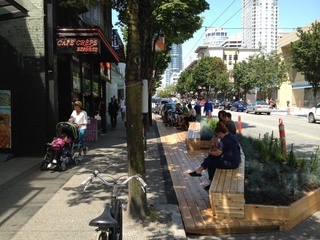 Put on your walking shoes or grab a bike and check out Vancouver’s parklets. The original parklet in Vancouver celebrated 6 years in the neighbourhood through a refresh this summer. The parklet is the first to be paired with a bike corral and modular decking and railings with more features anticipated. Long curving benches, beautiful wood decking, and lots of landscaping. A great place to sit and people-watch the throngs of Robson Street shoppers. Angular benches and multi-level planters. An inviting gathering place near the independent boutiques of Main St.
Steel and wood tables and benches. Have a break and experience the dynamic Drive. This two-level parklet makes for twice the enjoyment on the sunny slope of 4th Avenue. Sit, relax, and enjoy the ample seating and mini garden. A place where the grass is always green. Here you will find beach chairs under an umbrella, and custom-made wood and steel tables and stools. Already a popular hang-out, the Fraserhood provides custom-made wooden benches to sit and relax, and perhaps enjoy some food from one of local restaurants. Parklets are sponsored by private partners but are free and open for any member of the public to use. Advertising, table service, and other commercial activities are not permitted. The process from application to installation generally takes 8 to 12 months. If you’re interested in having the parklet installed for the summer season, we encourage you to submit your completed application in early fall at the latest. Dynamic public spaces – Parklets provide places for people to sit, relax, and enjoy the city. Wider sidewalks – Parklets can provide more space for people to walk where sidewalks are narrow or congested. Vibrant local businesses – Parklets are unique public spaces that provide seating and attract potential customers. Social life – Parklets foster a sense of community by creating welcoming public spaces. We have filled our 2018 private sponsorships. Check back for updates on intake dates. If you are a non-profit organization interested in a parklet, please contact us. Read the manual to learn about the application process, fees, responsibilities, design guidelines, and technical requirements. Tested for several years, City Council approved the Parklet Program on June 1, 2016. VIVA Vancouver is now looking for interested businesses and organizations who want to sponsor and build their own parklet.